Ella is now 4 months old and just survived her fourth camping trip. Most people think we are crazy, but when I got pregnant Aaron and I decided that life was going to continue, which meant taking along a baby when we went camping and hiking. Yes, it is hard to go tent camping with a baby. There are multiple times when I’ve wondered if the hassle is worth it. Just the extra gear alone is a hassle – there is a lot of camping stuff for babies you’ll end up needing. However, our goal is to nurture and develop a love of the outdoors in Ella. In my opinion, love of the outdoors needs to start early. Needless to say, the logistics for tent camping with a baby are a bit more difficult. It seemed like we needed double the gear for one very small individual. Before our first trip, I sat down and made a detailed list of everything I thought I would need. My first list was probably a bit overboard, but it gave me a good starting point. I started by listing the regular baby gear I would need and then I began a list of camping supplies for an infant. Look at your trip itinerary to see what extra baby camping supplies you’ll need. When we are tent camping, we do a variety of activities like hiking, biking & rock climbing. Obviously, we don’t take Ella climbing when we go rock climbing, but I definitely wanted a ground cloth (I used this foldable waterproof picnic blanket) and some form of shade for her. The object is to think of your baby’s comfort based on the activities you’ll be doing. 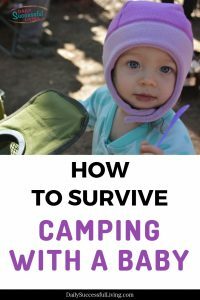 I have included my baby camping packing checklist at the bottom of this post with links to some of my favorite products for your convenience. If you are prepared then you and your baby will be significantly more comfortable. I had everything I needed for Ella in one big bag on our first trip. I was constantly digging for stuff, losing stuff and in general going nuts. For our subsequent trips, I’ve streamlined my packing and now do the following. Clothing bag – Everything clothing related goes into one bag with the interior pockets used for socks, hats, mittens and swimming suits. Miscellaneous Bag – I usually use the large Ikea bags or a duffle bag for all of the random extras like blankets, wraps/carriers, sleeping bags, mosquito netting, picnic blankets and boppy pillow. Plastic Bins – I use 1-2 bins to carry her formula, cleaning supplies, medicine, diapers, wipes and all the random supplies that I’d like to keep out of the heat. We live in Phoenix, so this is really important for summer camping trips. I use plastic bins that fit under the rear seat of our truck. Even if you don’t have to account for heat, the plastic bins are an easy way to keep these type of supplies organized and easy to locate. I also like them because they are easy to move around camp and then if I’m asking someone else to grab something for me, they can easily locate my supplies. Diaper Bag/Grab and Go bag – We tend to do a lot of day trips while camping, so I’ve found it beneficial to keep a grab bag of easily accessible supplies. I personally use a backpack style diaper bag, so depending on our day trips I can either grab my diaper bag (the easiest option) or pull a few supplies from the bag and transfer them to my regular backpack. Both options work. The main idea is to have food, pacifiers, clothing and diaper supplies easily accessible. Which on a side note, I recommend taking a few extra pacifiers. When tent camping with a baby, I recommend a larger tent if possible. Our first couple of trips we used a six-person tent, we’ve now upgraded to a 10 person tent. I know it sounds crazy, but having the extra space is awesome when you have baby supplies everywhere. Between our cots and her pack and play it is amazing how quickly space fills up. Obviously, you don’t need something this large, but if you have the room I say go big or go home. 3. Be prepared to sanitize supplies even if breastfeeding. Sanitization is critical with baby supplies. My main concern is always the bottles, but Ella will put anything in her mouth right now. I feel like I’m constantly cleaning stuff. When car camping we always have a large stove, so it is fairly easy to boil a pot of water and dunk everything. I bought a travel bottle cleaning kit that was awesome. They are very inexpensive and I use it all the time. You’ll want to sanitize bottles at least daily, particularly if it is hot. As soon as Ella is done with a bottle, I either stick it in the ice chest or immediately rinse it out. Rinsed bottles are put to the side and I wash all of them when I start to run low on clean bottles. Bring extra ice packs to keep bottles cold as needed. I used the flexible ones and would use a rubber band to hold them around the bottle in my backpack. If I had thought about it in advance I would have gotten some of the thermal holder things that people use for soda. 4. If you are breastfeeding make sure you have a way to pump. I wasn’t able to breastfeed, so I’m not an expert in this area. However, I’ve camped with multiple women who breastfeed. Virtually all women need to pump at some point, so be prepared. I’ve never used the hand pumps, but have heard they are horrible. I can’t imagine there is anything worse then trying to use a manual breast pump in the middle of the night while camping with a baby – especially if it is cold. We use the AC Power inverters which allow you to plug an adapter into your cigarette lighter. The other end of the adapter has a regular electric plug. It is much cheaper than constantly buying adapters for your individual products. We purchased ours for less than $20 and keep it in the truck all the time. 5. Make sure you have a good backpack or baby carrier for your baby. Camping baby carriers are super handy around the camp and useful even if you aren’t hiking. If you are hiking with a baby, it is even more important. Most people use the fabric wraps, the baby carriers or baby backpacks. All of them will work, but you’ll want to make an educated decision based on your level of hiking and the age of your child. I started out using a wrap, but realized really quickly that is wasn’t robust enough for my style of hiking. It survived my nature walk but just wasn’t that comfortable. Fortunately, a friend gave me an Ergo 360 which is perfect for Ella’s current size. The important thing is to try out your options before you get on the trail and realize you have problems. We also have a nice Osprey baby carrier backpack that I’ve used for my grandson, but at this point, Ella isn’t big enough to fit in it. Editorial note: If you plan to hike with your baby check out my post How To Hike With Your Baby. You can also read my review of the Osprey Baby Carrier Backpack. If you think getting a baby to sleep at home is hard, wait until you are camping. There is nothing worse than a crying baby when all your friends are trying to sleep in their neighboring tents. The stress of keeping your baby quiet makes everything so much worse. Even when your single friend assure you they didn’t hear a thing because they had earbuds in, you feel guilty. Which on a side note, I recommend setting up your tent away from everyone else and telling your friends to bring earbuds. Or better yet bring along a pack of these for everyone. Prior to bed make sure you have everything you’ll need laying out for easy access. I used the formula dispensers and premeasured my water so I wasn’t fumbling around in the dark. I had diapers and wipes laid out and made sure I had extra blankets and burp rags easily accessible. I had my headlamp, jacket, and gloves next to my cot. If it is warm, you have to be very careful with your bottles. During our summer trips, I would put out 3-4 bottles and only make 2-4 oz at a time. Once I used a bottle and it sat out for more than an hour I got a new one. Having a sick baby because of sanitation issues when camping would be miserable. One thing I’m still looking for is a super dim light that is easily activated. Everyone time I tried to use my headlamp (even when in red mode) it would startle her. Your goal is to make midnight feedings and diaper changes as easy as possible. 7. Sleeping arrangements should be your top priority. I can not stress the sleeping arrangements enough. Your baby will not sleep if they aren’t comfortable. Aaron and I typically use cots when car camping. Aaron has this huge monstrosity of a cot that takes up half of our big 6 person tent. I used to always complain about the size, but it was perfect for co-sleeping for our first couple of trips. If your baby is used to co-sleeping this is probably your best option. On our first few camping trips, I was very worried about keeping our baby warm while camping. Having a large cot and being able to co-sleep with her helped alleviate this fear. On our most recent trip, we messed up. Even though she had been sleeping mostly on her own for the last few weeks, I assumed we could easily co-sleep with her again. There were lots of tears involved (mostly from Aaron and me). Fortunately, I had brought her a baby bunting bag (it was in the 40’s at night), so we made her a little bed on the floor, bundled her up and she slept like a baby the rest of the trip. On a side note, I recommend getting the toddler size so they have room to move and grow. The bunting bag was great at keeping our baby warm while camping. One of my friends also bought one of the rock and play type sleepers that worked awesomely. I’d buy one, but Ella is almost too big now. There are a ton of travel options for infants now, so do a bit of research and find one that will work for your baby’s sleeping style. If possible try out your sleeping arrangements prior to the trip. Also, make sure that you account for warm or cold weather. Our first three camping trips I was worried about overheating her, our last trip I was sure she was going to freeze to death. This was the hardest part for me. I knew intellectually I was going to miss out on some of the activities, but sitting out my first canyoneering trip was harder than I thought. Aaron and I try and take turns with the non-baby friendly activities. It isn’t perfect, but some activities just aren’t designed for babies. If you will be sitting out the activities plan ahead. Staying at camp it is easy. Just make sure you have something to read. During one of our trips, I ended up waiting while Aaron did a canyon with some friends. We did it on the way home, so everything was packed up. It hadn’t even occurred to me that I might want a chair or even a tarp to sit on while I waited. Fortunately, I wasn’t the only person sitting out and was able to borrow some easily accessible gears. I had everything I needed for Ella but hadn’t thought about myself. 9. Be prepared for all types of weather. I doubt Arizona is the only place with crazy weather. Bring plenty of clothing for all weather situations. As an adult, I can easily handle minor temperature changes. Little babies aren’t quite as resilient. Keeping their temperature even takes a lot more work. When we camped over the 4th of July and at our family ranch trip it was blazing hot. Ella lived in onesies and I gave her sponge baths daily to make sure she wasn’t too sweaty. Our last camping trip was in Flagstaff and it got down in the 40’s at night. I was really stressed about keeping her warm. While hiking Kendrick Peak, we had a crazy rain storm come up. Although we had plenty of gear to keep Ella warm, we immediately turned around. Personally, my enjoyment isn’t as important as her safety. I quickly discovered that keeping a baby warm while camping was super important. I focused on lots of layers. I would start with a pair of socks, then some skin tight pants and shirts. Then I would add 1-2 layers of warm fleece footie pajama’s (I got a set in her current size and then a slightly larger set to make layering easy). I tried to put little tiny mitten’s on her hands, but she kept getting them off during the middle of the night. Finally, in desperation, I put socks on her hands and they worked perfectly. She didn’t like it, but they actually stayed on her hands and helped keep her warm at night. I also found a nice fleece cap with the velcro chin straps. Most of the time I had to slip it on once she was asleep, but if you get a tighter one that is snug (but not too tight), they will stay on while your baby sleeps. 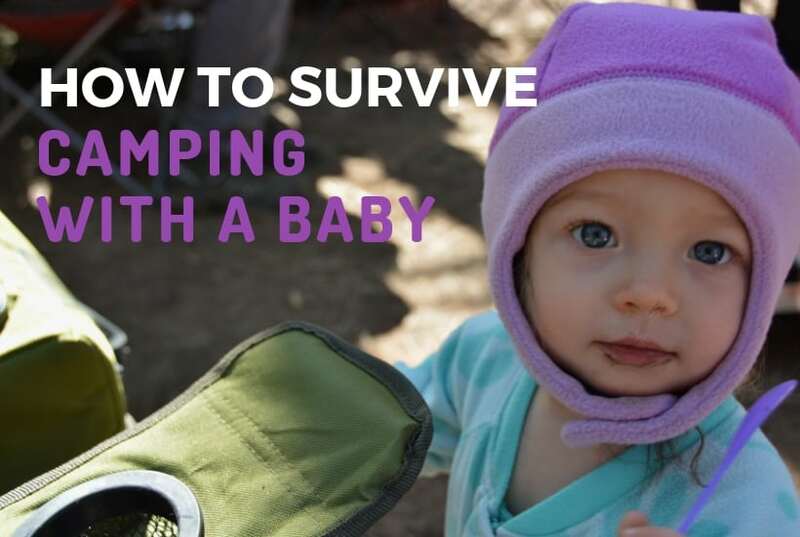 Keeping a baby’s extremities and head warm when it is cold is super important when you are camping. The other item I purchased that ended up being invaluable to keep my baby warm was a small snowsuit. I tried having her sleep in it, but that didn’t work well since she literally couldn’t move. It lasted less than an hour before I went back to my layering. Maybe I’m overprotective, but it just didn’t seem safe. However, the snowsuit was awesome for hiking. It was completely waterproof and super warm. I could never get the hood to stay on, but the snowsuit got a ton of use. If you want to hike with your baby and keep them warm, I highly recommend a snowsuit. 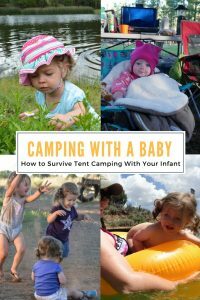 You can survive tent camping with a baby and even enjoy it! Is the extra work worth it? Yes! Tent camping with a baby is hard. Ella was up virtually all night the first night of our most recent camping trip. I remember looking at Aaron around 4:30 in the morning and asking if it was worth it. Fortunately, she calmed down shortly after and did great for the rest of the trip. I thought you guys would get a kick out of my IG post the next morning. I know that she won’t remember these early camping trips. It would be so easy to just stay home for a few years and start camping again when she gets older. Maybe I’m selfish, but I want to keep doing the things that I love and I’m hoping that by introducing her to the outdoors at a young age she’ll grow to love it as much as we do. Either way, the memories I’m gaining from taking her along are priceless. Even if she can’t remember, the pictures are worth the effort. Below is my Tent Camping Checklist for our baby. This list has links to some of the products I use for your convenience. Please keep in mind this list is for a baby. I’m sure I’ll be supplying a new list in the next 6 month’s as Ella gets a bit bigger and our baby camping needs change. This list is probably more than you’ll ever need, but baby clothing is so small that I don’t mind packing a bit of extra stuff. Cleaning brush and other cleaning tools – I use the Dr. Brown Bottles, so this is really important. Travel bottled drying rack – I know it sounds stupid, but this ended up being one of the handiest things I purchased. Baby washcloths – I use these for everything – burp clothes, snot rags, dishes, sponge baths. Grab a pack, trust me, you’ll use them. Plenty of diapers (Bring the good quality ones – camping isn’t the place for cheap diapers). I take double the amount I normally use. Wipes – I bring three full packages. One for in the tent, one for her diaper bag/backpack, and one for general camp use. Large Zip Lock bags. I keep them in my tent for night use and in her backpack. There is nothing worse than a stinky diaper in your backpack. I always double bag the poopy diapers. Mosquito netting – My friend got one of the bed canopy nets, we hung it from a tree and put both babies under it for protection. Nose Frieda or something similar – they will get stuffed up. Picnic Blanket or a tarp you can lay a blanket on – I prefer the picnic blankets. They typically have a water resistant side with a softer mat on the other side for sitting. They work great for babies. Multiple Pacifiers – I took 5 pacifiers and still felt like I was constantly looking for one. On a side note, I highly recommend the WubbaNub pacifiers – they are the best pacifiers ever! Bouncer, Boppy Pillow or sling you can set the baby in while hanging out in camp. The Boppy Pillow is particularly useful if you have younger cousins who are desperate to hold the new baby but need a little bit of help. Infant/toddler sleeping bag – I actually purchased a baby stroller bunting bag. I didn’t love the holes in the bottom for camping but love the fact that I’ll be able to attach it to her stroller when it gets colder. Dim light for midnight feeding and changing. I’m still looking for a good solution to this problem, so let me know if you have any suggestions. Pay special attention to sleeping arrangements, if your baby isn’t sleeping, neither are you or any of your neighbors. PS. If you are an active type you may also like my post – How to Fly With a Baby or How to Hike With Your Baby.